A mallet finger occurs when the mechanism that extends the finger is disrupted resulting in an inability to actively straighten the end finger joint (the distal interphalangeal joint or DIPJ). Usually it is caused by a tear of the extensor tendon, but it can also involve a fracture of the end finger bone. 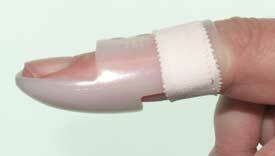 A mallet finger usually occurs after an injury, usually stubbing the end of the finger against an object. 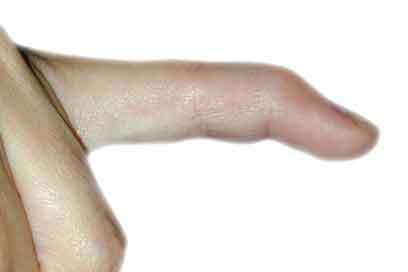 Pain is experienced and the end of the finger is typically held slightly bent (figure 1). It is possible to passively fully extend the finger, but this cannot be performed actively. An x-ray is usually taken to exclude a fracture of the end finger bone (the distal phalynx), which can occur (figure 2). Usually this can be treated by immobilising the finger for 6 weeks in a plastic splint which holds the finger tip extended (figure 3). In some cases with a fracture of the bone or if the joint moves out of place (a subluxation), surgery is required. This surgery is usually performed using local anaesthesia and the fracture is reduced and stabilised using either thin wires or a small screw (figure 4). Once treatment has been complete the splint is removed and the finger mobilised. Physiotherapy is occasionally required and most cases heal without further problems. Some times the tendon either fails to heal, or it heals with a small amount of lengthening. This causes the end of the finger to droop and it is not possible to fully extend it completely. Occasionally this results in a compensatory hyper-extension of the first finger joint (the proximal interphalangeal joint of PIPJ) causing what is termed a swan neck deformity (because the finger has the appearance of a swan's neck). Treatment is not usually necessary, but it is possible to rebalance the extensor tendon to correct this if required.